Spinach Chips are made by baking seasoned spinach leaves in the oven until they are light, crisp, and perfectly delicious. In an effort to not be an over-sized human, I have to try to seriously curb my potato chip addiction. I love potato chips more than a fat kid loves cake. Not that I would ever call a kid fat. That would just be mean. Me, on the other hand? I'm a Fatty McFatterson. No, I'm not practicing self-hate, I'm just acknowledging the fact that my son is almost three, so blaming my jiggly thighs on baby weight is almost laughable. I just eat too many chips. Damn those delicious, salty, greasy, crispy, glorious potato chips. I have been trying to come up with some alternatives to my beloved chips so that I can fit into the stack of jeans in my closet that are too small. I made Zucchini Chips, which I adore, so I'm working on transforming other veggies into chips so I can get my chip fix without so many calories. This time I went with spinach! Spinach has, obviously, a much more fragile texture than zucchini, so they came out a lot different than the Zucchini Chips, but equally as good! The first thing you have to do it add just a touch of oil to the spinach so it will crisp up. Then, add the seasonings of your choice and spread the spinach out to bake. I used one of my favorite combos to season my chips: garlic and parmesan. After just a quick few minutes in the oven (8 to be exact), the spinach chips are done! How easy is that?! Totally easy. You can't try to tell me that they're too hard to make and that grabbing a bag of potato chips is easier, because these literally take less than 10 minutes to make. You were probably going to just go veg out somewhere and eat those potato chips anyway, so instead, take the 10 minutes to make these. 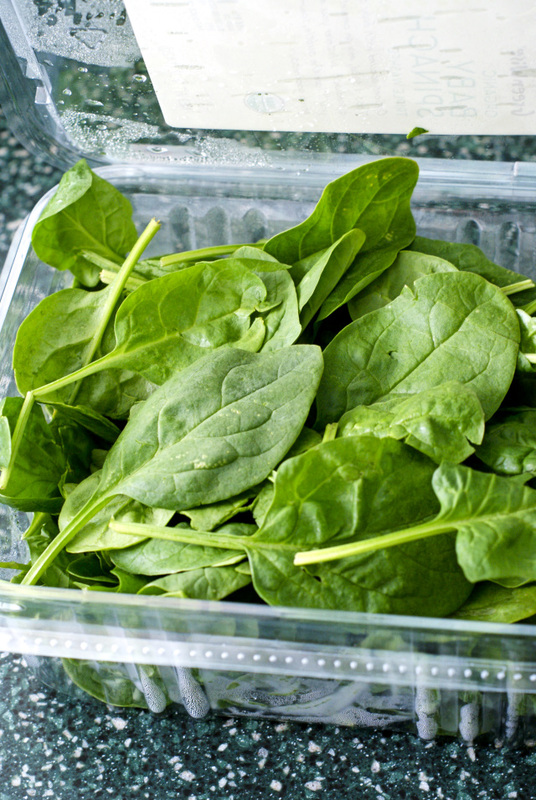 This recipe is made with 2 cups of spinach, which is one serving. That means that this recipe only serves one. Translation: you get to eat the whole pan all by yourself and not have one ounce of guilt. Guilt-free snacking? I'll take it. 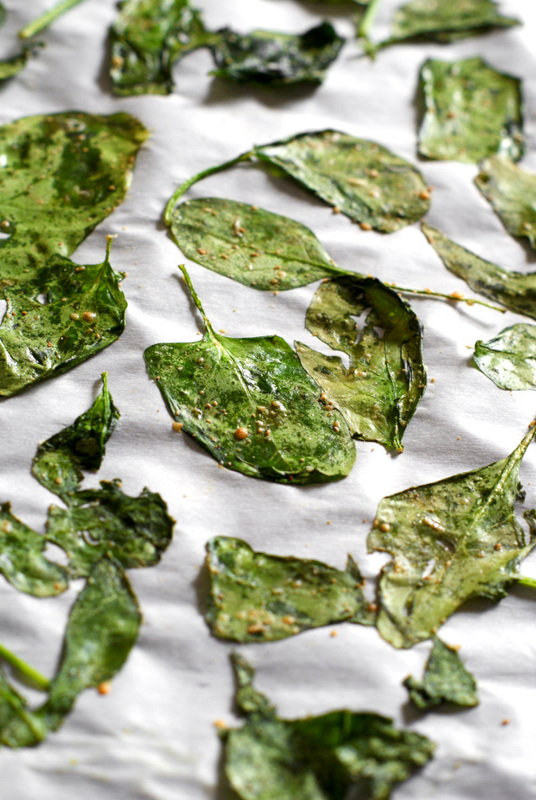 These spinach chips are light, airy, thin little crisps of deliciousness. Try them when you are looking for a healthy, easy to make snack! Gently toss the spinach with the olive oil to coat. 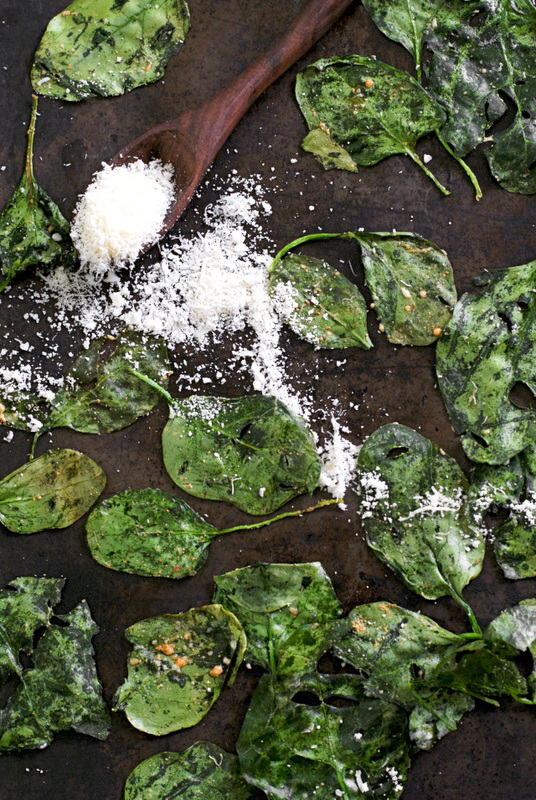 Sprinkle the spinach with the garlic powder and parmesan cheese and toss again to coat. 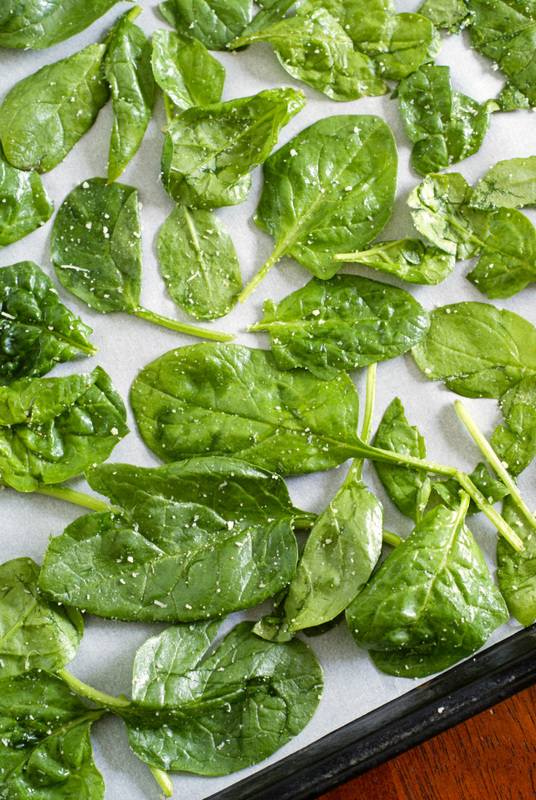 Lay the spinach out onto a parchment-lined baking sheet in a single layer. Bake in the preheated oven for 8-10 minutes, or until the spinach is crisp. You can mix it up and substitute the garlic and parmesan with your favorite seasoning mix. These look good. I am going to try making these tonight. I have tried the kale chips but I just don't like the taste of them. I, too, have been trying to come up with snack substitutions so I hope these turn out good.